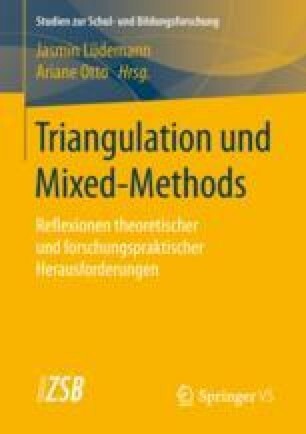 Beyond entrenched methodological disputes, Mixed Methods attempt to promote a combination of qualitative and quantitative materialities in a single study, suitable to study the subject of research and aiming at understanding social phenomena in a more comprehensive way than it would be possible with a monomethodological approach. This article focuses on the meaning and relevance of criteria for evaluating the quality of Mixed Methods Research. A complex and ambivalent state of discussion is presented based on current research literature, and the applicability of criteria for research projects is discussed. Adorno, Theodor W., Else Frenkel-Brunswik, Daniel Levinson, und Nevitt Sanford. 1950. The authoritarian personality. https://is.muni.cz/el/1423/jaro2017/SOC286/um/Adorno_et_al._1950_-_Authoritarian_Personality.pdf. Zugegriffen: 3. Dez. 2017. Breuer, Franz, und Jo Reichertz. 2001. Wissenschafts-Kriterien: Eine Moderation [40 Absätze]. Forum Qualitative Sozialforschung/Forum: Qualitative Social Research 2 (3), Art. 24. http://nbn-resolving.de/urn:nbn:de:0114-fqs0103245. Zugegriffen: 6. Apr. 2018. Creswell, John W., Ann Carroll Klassen, Vicki L. Plano Clark, und Katherine Clegg Smith. 2011. Best practices for mixed methods research in the health sciences. https://www2.jabsom.hawaii.edu/native/docs/tsudocs/Best_Practices_for_Mixed_Methods_Research_Aug2011.pdf. Zugegriffen: 4. Sept. 2017. Laucken, Uwe. 2002. Qualitätskriterien als wissenschaftspolitische Lenkinstrumente. Forum Qualitative Sozialforschung/Forum: Qualitative Social Research 3 (1), Art. 6. http://www.qualitative-research.net/index.php/fqs/article/view/888/1938. Zugegriffen: 7. Apr. 2018. Mertens, Donna, Pat Bazeley, Lisa Bowleg, Nigel Fielding, Joseph Maxwell, Jose Molina-Azorin, und Katrin Niglas. 2016. MMIRA task force report. The future of mixed methods: A five year projection to 2020. https://mmira.wildapricot.org/resources/Documents/MMIRA%20task%20force%20report%20Jan2016%20final.pdf. Zugegriffen: 27. Nov. 2017. Reichertz, Jo. 2009. Die Konjunktur der qualitativen Sozialforschung und Konjunkturen innerhalb der qualitativen Sozialforschung [48 Absätze]. Forum Qualitative Sozialforschung/Forum: Qualitative Social Research 10 (3), Art. 30. http://nbn-resolving.de/urn:nbn:de:0114-fqs0903291. Zugegriffen: 14. Juni 2018. Symonds, Jenny, und Stephen Gorard. 2009. The death of mixed methods: Research labels and their casualties. The British Educational Research Association. Annual Conference, Heriot Watt University, Edinburgh, September 3–6 (Konferenzpapier). https://www.leeds.ac.uk/educol/documents/174130.pdf. Zugegriffen: 26. Dez. 2017.